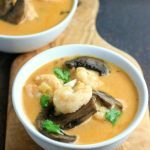 Keto Instant Pot Thai Shrimp Soup is a delicious, creamy, low carb, paleo, and whole30 soup with Thai flavors of lemongrass, lime, ginger, red curry and coconut milk. Press the Sauté button once. Once the inner pot becomes hot, add 1 tbsp butter. Once butter is melted, add the shrimp and stir until shrimp turns pink and begins to curl. Immediately transfer shrimp to a medium bowl. Set aside. Add remaining 1 tbsp butter to the inner pot. Once butter is melted, add onions and garlic and sauté until garlic is fragrant and onions become translucent. Press Cancel to turn off the heat. Add chicken broth, lime juice, fish sauce, red curry paste, coconut aminos or tamari sauce, lemongrass, mushrooms, grated ginger root, sea salt, and black pepper. Stir to combine. Cover, lock the lid and flip the steam release handle to the Sealing position. Select Pressure Cook on High, and set the cooking time for 5 minutes. When the cook time is complete, allow the pressure to release Naturally for 5 minutes (Don’t touch the pot for 5 minutes), and then carefully quick release the remaining pressure by flipping the steam release handle to “Venting”. Press Cancel to turn off the heat. Remove the lid. Add shrimp and coconut milk to the pot, and stir. Press the Sauté button twice (“more or high” setting will light up), and let the soup come to a boil. Once boiling Press Cancel to turn off the heat. Let soup rest for 2 minutes in the pot. Ladle the soup into bowls, sprinkle cilantro over the top to garnish and serve.